The Yorba Linda High School Mustangs clinched their second consecutive Century League Friday night after handily defeating the Esperanza High School Aztecs 8-1. The win brings them to 14-2 this season with only two games left to play. The Mustangs are now an impressive 30-4 over the last two seasons. Following last year’s success the Mustangs stepped up the strength of schedule this season and their only losses were to two Top 10 teams, St. Margaret’s (7-3) and Great Oak (8-4). The Mustang starters for the championship game were Brandon Cyprien, Kaidon Newberry, and Kyle Price at attack, midfielders Jack Diederich and Ryan Viadero , LSM Justin Anderson, defenseman Mitchell Flood, Kevin Anthony, and Nick Viadero and Goalie Mark Renfro. Following the leadership of Viadero, Diedrich, and Flood, the Mustangs have responded well to the demands and high expectations of Program Director and Head Coach Mike Schreiber. With Schreiber at the helm and the influx of talent that the team’s success is attracting, Yorba Linda lacrosse appears to have a very bright future. 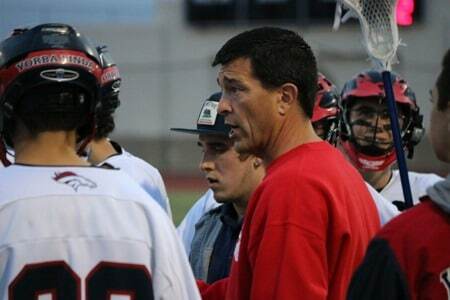 Coach Mike Schreiber has the Yorba Linda lacrosse program moving in the right direction. Viadero, who earned his fourth varsity letter this year and will represent Spain in the World Lacrosse Championships this summer, showed great leadership in taking command of the offense by distributing the ball and creating multiple assist and goal scoring opportunities for the entire offense. He will graduate in a few weeks as the Mustangs’ All-Time Point Leaders. Captain Ryan Viadero will represent Spain in the World games this summer. Diederich, a talented athlete with raw speed and power developed several new offensive weapons this season to become a top all-around player and a leading point scorer. At crucial times in the game, Diedrich has the ability to come up with the key play and tends to always be a part of the action whether on the defensive or offensive end of the field. He will finish his fourth varsity season using his leadership, attitude, and motivation to help the Yorba Linda High School Lacrosse Program reach the next level. Captain Jack Diedrich using his athleticism. Captain Mitchel Flood playing some tenacious D.
One of the Mustang strengths this year has been their depth, and other key contributors include Corey Castro, Sean McDonald, Spencer Chabot, Jonah Felty, JT Timmins, Noah Tonies, Jake Norton, Alex Vega, Nick Bazzo, Michael Ripley, Matt Sparkman, Ian Shapiro, Ryan Guerrero, and Jacob Pagoaga. Next up Senior Night Monday against Temecula Valley! Last time I checked, Tustin is in their league and since they still have a game against Tustin next week, I find it VERY disrespectful for Yorba Linda to be calling themselves the Century League Champions already. Just look what the Eldorado girls ranked #38 did to #9 ranked Newport Harbor last week. Anything can happen. VERY disrespectful to the Tustin players. Yl has no class !! Calling them league champs is what they have earned for this season. check your facts before posting and making yourself look clueless…. serious question, since it was characterized by the maxlaxoc twitter that the yorba linda/el dorado game ended in a fight, were any yorba linda players suspended for there game against esperanza? Since I know that at least one el dorado player was suspended for their next game. The game was called w 30secs left after ElDos lumbering lineman cheap shot a YL player by running over him from behind after the whistle had been blown. If there was any suspension it would be on him and no one else. I did hear from Eldo that yes one player was suspended for a game. The original illegal hit resulted in a scuffle and one player getting a penalty. When play continued so did the chippy play and after the whistle blew again a player ran all the way across the field and ran over a few players, it is my understanding that this was the player who was suspended. And this resulted in the game being called. Since when has clinching a championship been disrespectful to remaining team(s) whose game(s) is/are left to play?